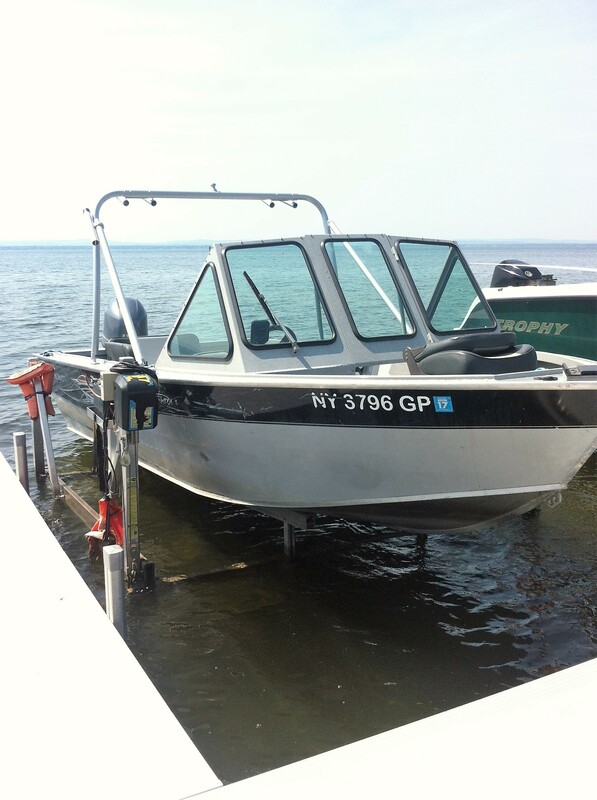 We offer Oneida Lake’s largest selection of rental boats. If your looking to fish, cruise the lake, or enjoy various water sports, Anglers’ Bay is your best choice. We offer a variety of fishing boats ranging from three person, fourteen foot fishing boats with 8hp motors, all the way to tweleve person pontoon boats. Grab your friends and enjoy a cruise, check out Sylvan Beach, Three Mile Bay, or even the Erie Canal system. We do not allow pets or grills. PLEASE NOTE: WE DO NOT TAKE RESERVATIONS VIA EMAIL, YOU CAN BOOK ONLINE OR CALL. RESERVATION REQUESTS MADE BY EMAIL ARE NOT VALID. We do deliver boats (multi-day rentals) to Cazenovia Lake, DeRuyter Lake, and others for an additional fee (depends on travel). We are now open for the 2018 season. We are open daily from 6am to 8pm weather permitting (6am to 7pm Labor Day weekend and 8am to 5pm after Labor Day)–please call us for time slots at 315.675.3662. Our booking office is open seven days a week from 9am to 5pm during the season. We strongly encourage you to book online for the fastest possible confirmation. The hours below are applicable from May 1 to Labor Day, after Labor Day, we are open from 8am to 5pm to the season’s close. Four Hours (four hours not available on weekends or holidays) $189 plus tax, gas, and security deposit of $300. Eight Hours (not available during holiday periods) $299 plus tax, gas, and security deposit of $300. All Day $319 plus tax, gas, and security deposit of $300. Holiday Periods (May 27, 28, 29, July 1, 2, 3, 4, September 2, 3, 4) ALL-DAY rentals only $399, plus tax, gas, and security deposit of $300. Four hours (four hours not available on weekends or holidays) $199 plus tax, gas, and security deposit of $300. Eight Hours (not available during Holiday Periods) $309 plus tax, gas, and security deposit of $300. All Day $329 plus tax, gas, and security deposit of $300. Eight hours only(9-5 only), $499 plus tax, gas and a security deposit of $500. Requires operator to be older than 25 and display a boater’s safety card the day of rental. Four Hours $39 plus tax. Eight Hours $59 plus tax. All Day $69 plus tax. Four Hours $139 plus tax, gas, and $300 security deposit. Eight Hours $179 plus tax, gas, and $300 security deposit. All Day $199 plus tax, gas, and $300 Security deposit. 6 Person Phantom Offshore Fishing Boat with 115hp Motor. Four Hours $179 plus tax, gas and $300 security deposit. Eight Hours $279 plus tax, gas and $300 security deposit. All Day $299 plus tax, gas and $300 security deposit. No one, including the weatherman accurately predicts lake conditions the day before a scheduled trip. Anglers’ Bay makes the sole decision on the morning of the trip regarding lake and weather conditions. Do not expect cancellations due to potential conditions prior to the morning of the trip. If Anglers’ Bay cancels the trip due to inclement weather or poor lake conditions, we give our customers the option to reschedule their trip. If a trip cannot be rescheduled, a full refund will be made. 30 days prior to your reservation you may cancel and receive a full refund, minus a $25 processing fee. 15-29 days prior to your reservation you may reschedule within 30 days, minus a $25 processing fee, but will not receive a refund. If you fail to reschedule within those 30 days, will will not offer a refund. 0-14 days prior to your reservation you may not reschedule or refund. ALL CANCELLATIONS MUST BE MADE VIA EMAIL: BOOKING@FISHONEIDA.COM to provide a record of a cancellation. Cancellations requests are not accepted by telephone. For security reasons and to comply with New York State laws regarding boat rentals, the PHOTO ID and the Credit Card used to make the reservation are required at check-in. If you fail to bring either of these we cannot allow you on the boat and will not provide a refund. To secure your reservation, the reservation is charged in full to your credit or debit card at the time you make the reservation. A credit card and boater information is taken for every reservation and is kept on file regardless of the method of final payment or the use of any gift certificate, charitable donation, or coupon. You must indicate at the time you make the reservation if you are using a gift card, charitable donation, or coupon.